Over the past week, more than a hundred thousand executives, tech analysts, and other mobile industry insiders gathered in Barcelona for this year’s Mobile World Congress (MWC), the biggest annual mobile hardware conference on the planet. 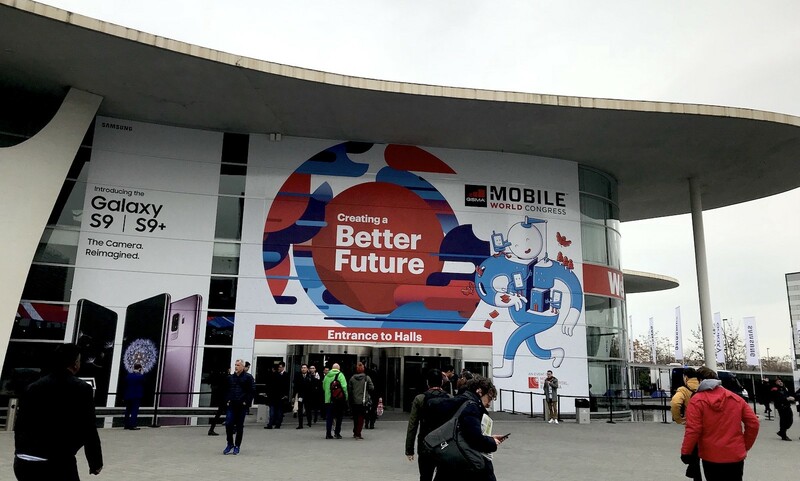 The theme of MWC this year is “Creating a Better Future,” which, judging by the buzz coming out of Barcelona this week, will depend a lot of the impending arrival of 5G connectivity and AI-powered mobile solutions. As a global-facing conference, MWC typically offers a more accurate reflection of the smartphone market worldwide — predominantly flooded by Chinese manufacturers instead of the Apple-Samsung hegemony typically seen in North American markets. As with years past, the event is filled with the usual flagship phone and device launches from just about every smartphone manufacturer, save for Apple. As with other big tech gadget events, Apple’s official absence at MWC only served to accentuate its influence over the industry. Samsung kicked off MWC by launching its latest flagship smartphone, the Galaxy S9, on Monday evening, which sports a sharper camera and not much else in terms of hardware specs or design. But it does come with a new feature called AR Emoji, which is clearly inspired by iPhone X’s Animoji. While Animoji turns you into adorable emoji faces, Samsung’s approach is more akin to a live 3D Bitmoji created based on your facial scan. Early reports also seem to indicate that AR Emoji lacks in facial mapping accuracy compared to Animoji. Then there is the front notch on iPhone X, which has predictably found its way to many a smartphone model coming out of China. The high-profile clones include the ZenFone 5 by Asus and the Huawei P 20, but the “edge-to-edge screen with a notch on top” look has percolated into the lower-end market as well, as evidenced by many phones made by lesser-known Chinese manufacturers, even though they don’t necessarily need a notch in order to house a sophisticated depth-sensing camera system, as the more premium handsets do. Generally speaking, the industry verdict seems to be that the notch is here to stay, however much Samsung loves to mock it. The Apple effect does not just stop at the notch. Other smartphone manufacturers that clearly took some design cues from Apple include ZTE’s Blade V9, which sports a full glass back as well as, the two new Xperia phones from Sony, which no longer have the headphone jacks that Apple infamously removed since the iPhone 7 models. Meanwhile, the word on the street is that Apple is prepping a new smartphone lineup with even bigger displays, so perhaps come next year, we will see even bigger phones that everyone needs to hold with two hands. That being said, this MWC also saw some quirky innovative designs popping up here and there. Case in point: the pop-up camera. Chinese phone-maker Vivo showcased an Apex concept phone that hides a pop-up camera behind its full-screen display for you to take selfies with. Similarly, Huawei’s new laptop has a mechanical pop-up webcam hidden in the keyboard, so as to save you the trouble of putting tape over your webcam for privacy concerns. For another recent example of how Apple is leading the trends in mobile design, check out our summary of all the wireless charging devices we saw at CES. Outside the new handset launches, the conversations at this MWC seem to be dominated by talks of 5G and AI. Everyone in the mobile and telecom industries is excited to talk about the plan for rolling out 5G services, starting with limited testing in limited cities, as well as the potential impact that such deployment will bring to the mobile market. Just last week, AT&T announced the first handful of cities where it’ll roll out its 5G network later this year. This week at Mobile World Congress, T-Mobile and Sprint did the same. T-Mobile announced it will soon start testing 5G in New York, Los Angeles, Las Vegas and Dallas first, with plans for a wider roll-out to 30 cities total by the end of the year, whereas Sprint announced that it will bring “5G-like capabilities” to six big American cities in early 2019. Internationally, Chinese phone manufacturers are leading to charge on 5G. Huawei said it will work with UK carriers BT and EE to trial 5G across the pond while ZTE announced partnerships with major carriers MTN and Ooredoo to bring 5G wireless technology to Africa and the Middle East. Amidst all the excitement, however. it is important to remember that the earliest timeline for 5G puts the first wave of mainstream adoption at 2020. 3GPP, the technical body that coordinates development of the various connectivity standards, is still working on finalizing the 5G specifications in “Release 16,” which is not due until December 2019. So, much of the 5G talk right now is simply marketing hype from the mobile carriers. In addition, even if you happen to live in any of the aforementioned test markets, you’ll need a 5G-compatible phone in order to enjoy the super-fast mobile internet speed. Those phones have yet to come to market yet, although various manufacturers have made plans to launch 5G-compatible models by next year. Nevertheless, the mobile industry is already planning ahead so as to take advantage of the impending arrival of 5G. For example, Intel is planning to blanket Tokyo in 5G for the 2020 Olympics, hoping to leverage a superfast network to enable high-res video streams in cars and “pervasive facial recognition” for security and stadium admissions. For more on the implications of 5G connectivity, in particular for brands, check out our CES trend recap on this topic. Beyond the hype surrounding 5G, artificial intelligence (AI) and all the mobile innovations it powers also took center stage at this year’s MWC. Primarily, this AI hype manifested in the form of using AI-powered analytics and software solutions to enhance the mobile experience. For example, a number of the new phones unveiled this year touts machine-learning software layer that improves camera performances, as well as offering more customization based on individual user preferences. On Wednesday’s keynote session “Creating an Artificially Intelligent Future,” AI researchers and robotics gathered to dispel some of the confusion and inflated hype surrounding AI. The panelists also urged mobile operators to embrace the algorithms that are getting better and better at anticipating our needs. A following companion discussion featuring top execs from Google, IBM, and Salesforce covered similar grounds to offer the attendees a broad picture of what the leading companies are doing in AI researches. As for the potential workforce disruption that AI-powered automation may bring, the bigwigs remains optimistic, as they believe AI will create new jobs but workers will need to receive the necessary training to develop new skills in order to be employable. Throughout the conference, Google seemed adamant about putting its digital assistant front and center. The search giant kicked off the week by announcing that it is adding “Routines” to Google Assistant so that users may activate a set of programmed actions with multiple connected devices with one command. It is also working with smartphone vendors including Xiaomi, LG, and Sony to integrate Google Assistant with the specific hardware and software of smartphones, allowing developers to link a specific intent in a Google Assistant voice app to a specific experience in an Android app. Furthermore, there will be support for more languages and location-based reminders coming to Google Assistant soon. Google Assistant’s archrival Alexa also had a presence at MWC this year, thanks to an escape room, where players get their cues from talking with Alexa, that Amazon created to promote its upcoming action series, Tom Clancy’s Jack Ryan. Meanwhile, BMW believes that in-car digital assistants still have a way to go before becoming truly helpful for drivers, namely they need to go beyond being “Echo Dots in a cup holder” and become more integrated with the car’s infotainment and navigation system. AI will bring significant changes and opportunities to brands seeking to optimize their customer experience with automation and personalization. For a refresher, you can check out one of our most popular posts from last year, A Marketer’s Guide To Artificial Intelligence. The biggest AR announcements at this MWC came from Google on Monday, as the company officially released its ARCore framework to the public and announced AR partnerships with Porsche and FC Barcelona to explore how AR can enrich the Android experience for the two brands. Moreover, the search giant also announced it is working with Sony Pictures on a Ghostbuster-themed AR game modeled after Pokemon Go that will likely introduce mobile AR to an even wider audience. If you need a primer on how Google’s ARCore differs from Apple’s ARKit framework and learn more about how mobile AR generally works, place check out this explainer piece from us. As with all the other recent tech events, there’s no hiding from cryptocurrency hype at MWC. Following brands like Burger King and Kodak that jumped on the crypto hype train to generate buzz, it seems like the mobile world is also getting in on the action. Japanese ecommerce giant Rakuten announced at its MWC keynote that it plans to turn its loyalty-program points into crypto-tokens called Rakuten Coin to allow for a more future-proof reward system. However, Rakuten didn’t specify when the transition of the program would start, nor whether the tokens would trade freely on exchanges, so it is unclear how serious the company is about leveraging cryptocurrency to enrich its customer experience. And if you have been doing well with your Bitcoin investment and needed a secure mobile wallet to prevent against hacking, the new SikurPhone has got you covered with a built-in ‘hack-proof’ cryptocurrency wallet. Similarly, Archos demoed a cryptocurrency wallet dongle device that can secure crypto wallets. For a more quirky example, someone at MOBGEN:Lab found a way to connect the watering system for a desktop mint plant to an office-only private cryptocurrency and made the value of the currency tied to the health of the plant so as to encourage workers to take care of the plant. If you need a refresher on what the cryptocurrency craze is all about, check out our two-part series on the blockchain technology powering this new form of digital currency.